Do you have too many projects lying around? It becomes difficult to focus with a lot of unfinished projects. I just finished teaching a class series focusing on aspen trees and now I have 4 demo paintings in various stages of completion that I need to finish up. I also taught a snow scene class earlier in the year with the idea that one of these paintings would become my Christmas card painting for this year. However, I never completed the painting. So, now that it is almost time to send Christmas cards, I am feeling the pressure to get this painting finished and printed. So, while I am in the process of cleaning up my studio and completing projects, I thought I could use these paintings as a blog demo. The following is a description of where I am in the process of painting. This is my snow scene for my Christmas card. This painting is on Yupo (a plastic that is used for printing in some magazines). Working with Yupo for snow scenes is great because the paint sits on the surface and remains very vibrant and the whites are brilliant. I have a lot of this painting completed. I started by painting in the sky with a mix of cobalt blue and manganese and then I mixed a purple gray for the back ground trees. I wanted these trees to feel like they were in the distance and thick with branches. 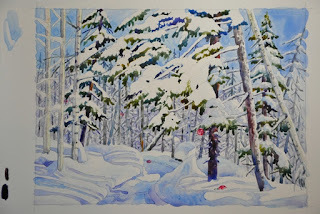 I then painted the green pine needles, the trunks of the foreground trees, and the shadows on the snow. I used masking on the snow that is hanging on the branches. It is very easy to lift with Yupo, so I could have forgone the masking, but this will give me cleaner edges. I like making my Christmas card scenes quiet and peaceful. Sometimes I will add an ornament to a tree to spruce the scene up a little and give the idea that someone has been there, without actually showing a figure. This scene lent itself to a trail of ornaments that invite the viewer down the path in the snow. 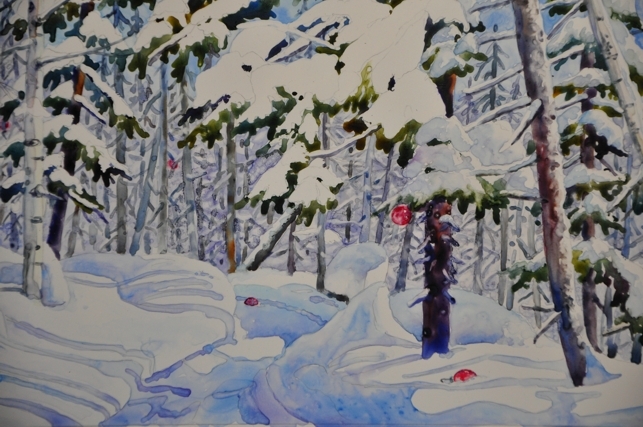 My next step will be to soften some of the edges of the snow on the pines and put some shadows on them. 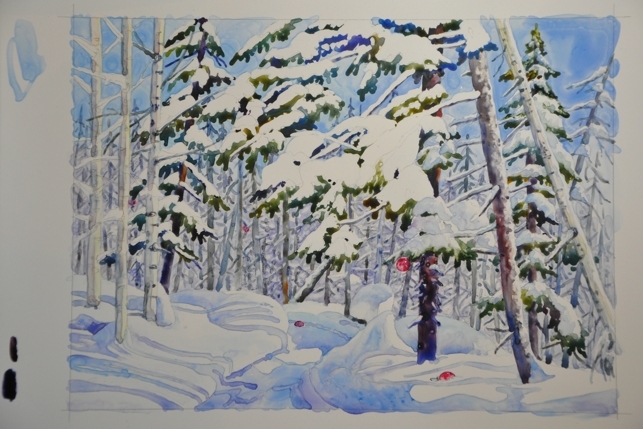 Then I will finish up the trunks of the foreground aspen trees and I think it will be finished. I will post the finished painting, hopefully soon. This is one of the aspen paintings that I need to finish. This painting is on watercolor canvas. I stretched a piece of watercolor canvas around 12x20 inch stretcher bars to get the proportion I wanted of a long narrow painting. I then did my sketch directly onto the canvas and masked the foreground leaves to protect them while painting in the background and shadows on the tree trunks. I decided to use very strong sunlight in this scene and the white of the canvas is the white of the trees on the right side. The background sky and leaf foliage was painted in first. I painted the leaves in while the sky was still wet so that they would have a soft edge. Next I started putting in the shadows on the left of the trees and the branches. For the purposes of my in class demonstration, I skipped some steps and took some off the masking of the foreground leaves to demo how I would paint them (the shiny spot on this photo is some of the masking that still needs to be removed). In this close up, you can see the foreground leaves and a variation of color in some of them, to give more visual interest. I have also started to paint some of the darker markings that are found on aspen trees around the branches and on the trunk. I will post more steps as I work to complete these two paintings and hopefully get some clutter out of my studio and off my mind!